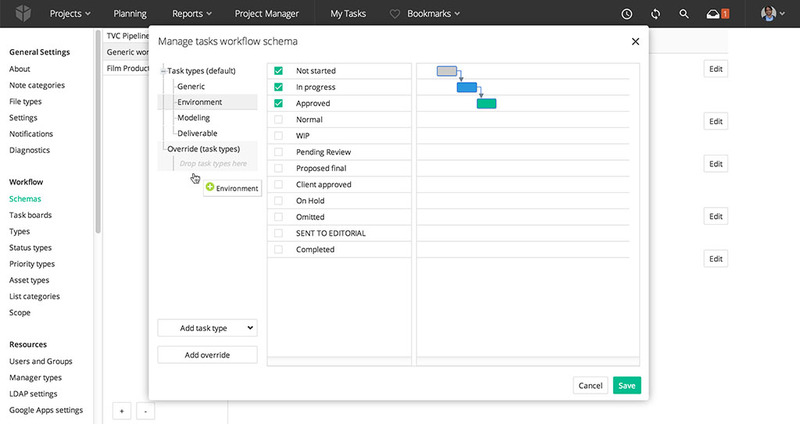 Before you can start working with ftrack and create your own project you need to have a workflow schema set up. Workflow schemas define the building blocks for a project and they can be different depending on what type of project your company is working on. The workflow schema allows you to choose what objects should be used in the project and how they can be configured with different statuses and types. While a smaller studio might only need one schema, larger facilities could benefit from using different schemas for different projects. You can find the workflow schema settings page at System settings ‣ Workflow ‣ Schemas. ftrack ships with a default setup that you can edit or remove if you would like. 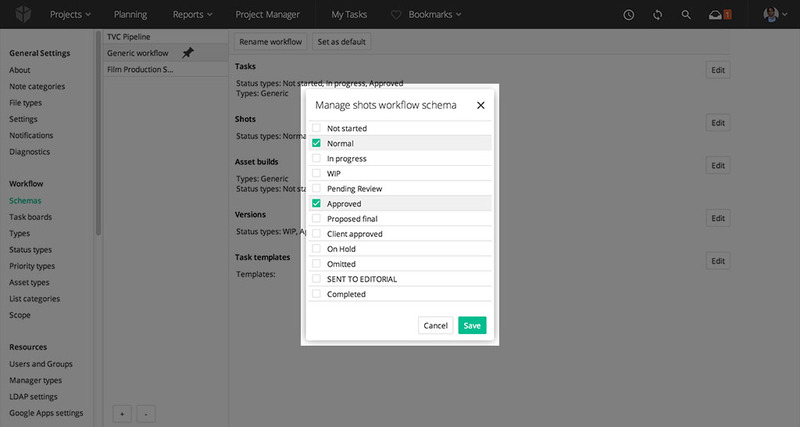 When you create a new project you can select workflow schema you would like to use. Before proceeding, make sure you have the Objects, Types and Statuses you need for your project. Click the (+) button in the bottom left corner to create a new schema. Enter a name in the dialog that appears and click Create. In the edit view that is displayed, you can select which objects should be included in your schema and for each object what statuses and types they should be allowed to have. The red triangle means the workflow schema isn’t valid since the required settings not yet are set up. To edit a schema, select it to the left (in this case we will edit the schema My schema created in the Creating a schema section above). 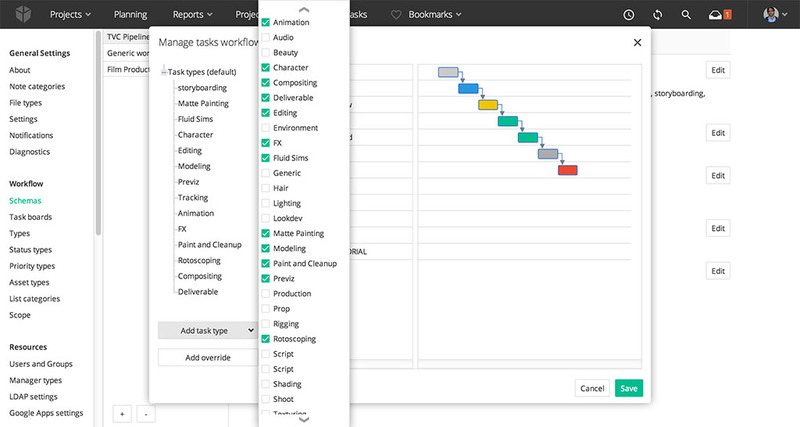 To add some types and select statuses for Tasks on your project, click Edit in the Tasks category. In the dialog that appears, you can add types to your schema by clicking Add task type and select types in the menu that appears. Statuses that should be available on the task types can be selected to the right. 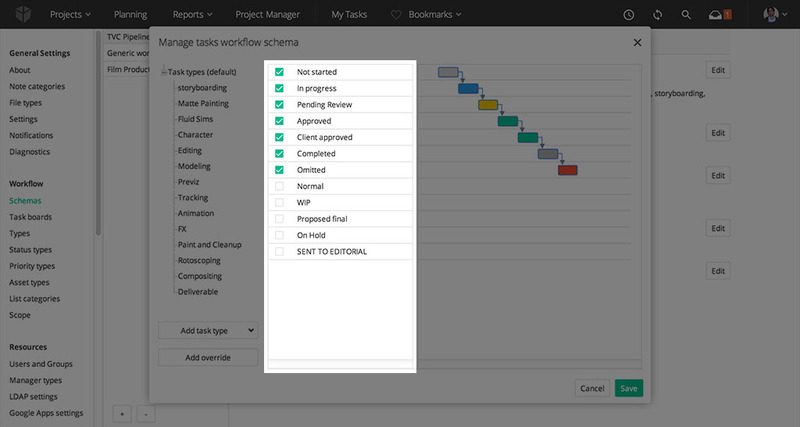 All task types added to the workflow share the same status types. However, you can add overrides for specific task types if you want to have other statuses available. For instance, Animation could benefit from other approval steps such as blocking, rough animation, final animation etc. To add an override for a specific task type, click the Add override button and continue by dragging and dropping the task type from the task types category to the recently added overrides category to the left. Select the task type to the left and then select status types to the right that you want that specific task type to have. To change what statuses that should be available on other objects, click Edit for that object. In the dialog that appears, select types and statuses you would like to use and click Save. Learn how to manage task templates at "Using task templates". To remove a schema, select one to the left and click the (-) button in the bottom left corner.